Our pricing starts at $1600 for a full gown and goes up to $5000+ but most of our styles are between $2000-3000. As a rule of thumb, the more lace or beading, the more expensive the gown. Additional customization fees may apply, depending on the request. We also have a wide range of bridal separates such as lace tops, jackets, and skirts. These range in price from $300-2500+. Contact us for specific pricing. We are proud to partner with fabulous retailers across North America. You can find the retailer nearest you by visiting our Stockist page. If you are dreaming of trying on a specific gown, contact your nearest shop to see if they have that sample. If they do not, we often can lend one to them just for you! Lending fees and shipping costs may apply. 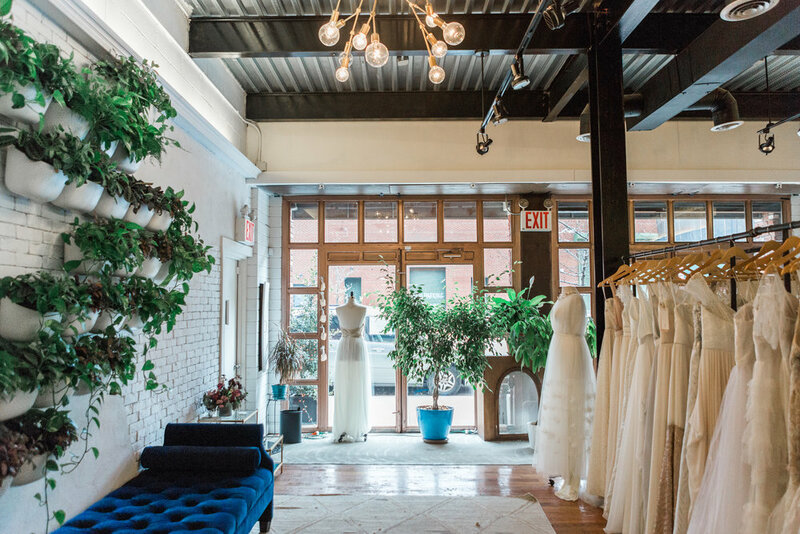 Our entire collection is available to try on at Schone Bride- our flagship boutique in Brooklyn, NY, which is also where all our gowns are made! Make an appointment at Schone Bride by clicking here. Most of our gowns take 16 weeks to make, although we do have rush options as fast as 4 weeks when possible! Rush fees do apply. We also have a selection of our best selling gowns that are available within 6 weeks for those of you who are in a real pinch! Contact us for more info. If you live near one of our retailers, we highly recommend that you order your gown through them, so all measurements and details can be discussed thoroughly in person. Once you know which is "the one", we require a 50% deposit of the entire gown cost upfront to confirm the order and to start the gown. The final 50% is due within 14 days of being notified that it is finished.